I am installing a sidewinder exhaust on my cb performance 1835 engine . It has a oil cooler and a spin off filter. My problem is the Mahle OC 84 filter is a tad too long for the header to fit. It is ~ 3.25" long. I could use a filter that was 2.5 or 2.75" long. Any idea on how to find such a beast? I have been looking through the Mahle online catalogs, but they do not provide dims. Here's my suggestion: take the oil filter element to your nearest independent auto supply store, or one that is known locally for having experienced clerks. Then find the most hopelessly outdated guy available (he'll not likely have piercings, ear lobe inserts, or neck tatoos). Show the guy your element, explain your needs, and he'll bury himself in a cross-index book for a few minutes, then put 3 or 4 elements on the counter for you. You may want to check the specs on your micron size before shopping. Best of luck! Any chance you could relocate the filter mount for better clearance? Having the filter that close to the header will allow heat transfer from the header to the filter’s oil if they remain close together. Jim, good idea. I know just the toothless old guy to ask. Gordon I thought the same thing. Also the oil cooler lines run right on top of the header. My current plan is to take the filter off (time to change the oil anyway) install header (temporarily) and see what relocation options could be. This spin off is a cast piece that bolts to the block , so to relocate might have to get another system all together. Looks like CB offers a few. To quote Homer Simpson, "Nuthin's easy." ...To quote Homer Simpson, "Nuthin's easy." But that's half the draw of these cars, no? When it came time to relocate my cooler (which meant relocating the filter, too), this Setrab filter mount solved some problems because it can be mounted and the hoses hooked up in a number of different orientations. Look at the bright side - the more money you spend on this, the easier it will be. I am redoing a 1976 BMW 2002 right now. Same thing. I wanted to change the steering wheel which meant reworking the horn, blinkers , and hub before even starting on the steering wheel adaption. It never ends and you are correct sir, that is part of the fun. Moto have a look at this one....nice? is it real? Passenger side has a few line up issues. It is beautiful original condition. Wow. Where is it and how much are they asking? He says appraised at $32k. The non tii models - non roundies in perfect condition are bringing mid 20s. Upgrades to look for are brakes (4 wheel disk) It has the better bottle cap wheels. Probably 14s. 5 speed or 4. Upgraded master to tii master. Steering box can get pretty weird too. And the usual stuff : suspension , exhaust, etc. But if the photos are to be believed - this body looks great , redone interior all original. Really good. Body work can really drain your patience and bank account . This one looks great. Mine? I am doing more of a resto mod e10. I'm using the same filter mount as Mitch, but I got it in au-natural aluminum silver to look cool. Figured it would look nice, tucked way up in beside the engine where all you can see is the bottom of the filter can. It's a pretty rugged mount, as my filter seems to like to make a super-glue-like bond to the mount and I have to practically blast to get the damn thing spun off and the mount is still intact (so far). CMC has a big square horse shoe frame member surrounding the engine so I just bolted my mount right to that. Done....I thought, but I moved it once when I added a Mocal oil thermostat sandwich switch between the filter mount and the filter can. My oil hoses from/to the engine go close to the header tubes, but they have a couple inches of clearance and haven't been a problem. Those hoses are teflon inside of stainless braid. I needed the oil thermostat switch once I got the gas heater running and started driving in colder and colder weather. I also like the GHia around 1971. The problem with all of these is man how many cars can I upkeep My IM is good but I have that and all the rest of our DD not much time left for anything else... well maybe the dogs. This is the on I use. 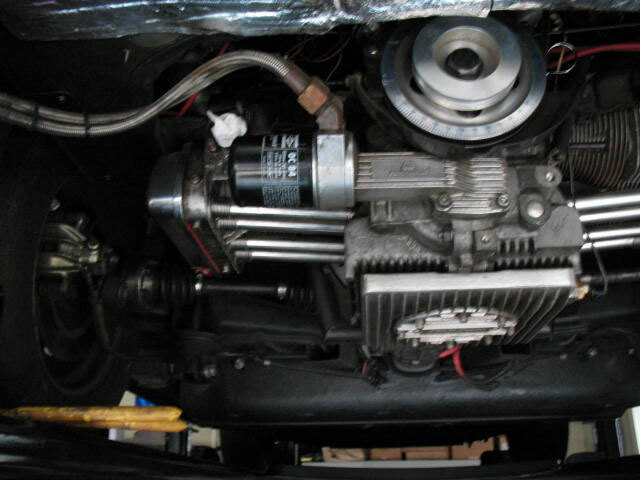 Mahle OC 25. I use a piece of heater supply duct (Heater Box to Chasis tube) as a protective sleeve slid over the filter as the filter is in the wheel well. I'll take a picture and send it on later. Thanks Mike. Mine is an OC 84 and about 3.25" long. If you get a chance to take that photo, could you throw a ruler on it and see how long the OC 25 is? According to the catalog the OC25 is 93.5mm in height which converts to 3.68". I found the online Mahle Catalog and it has an extensive listing of oil filters and their dimensions. Here are some of the shorter filters: OC 1051 2.89", OC 619 2.5", OC 606 2.89", OC 500 3.15", OC 494 2.89",OC 458 2.89", OC 1253 2.6", OC 272 2.89", OC 242 2.89", OC 230 2.58", OC 205 2.89", OC 64 2.5", OC 21 3.14", and OC 11 2.5". Wow. Thanks Robert. I could not find this when I searched. Big help. I got lucky. Even a blind squirrel finds a nut once in a while. Here are photos of the dilemma. I think I will go for a 2.5 or 2.25" tall filter, then deal with the heat as I did before - wrap the pipes. My only concern with such a short filter is wether or not you’d have to change it more often. There’s a lot less filtering surface available and my concern would be it would become less efficient sooner. I’m not a very technical person so I could be worried about nothing. I thought the same thing Robert. But I only drive it about 1000 miles a year , and the filter and oil get changed every year even at that low mileage. Also there is a bit more oil in the system since it has an separate oil cooler (radiator). And it still has that bogus VW oil screen. Sounds to me like you’re changing it often enough it won’t be a problem. This is 1 of 2 issues with the pump/filter assemblies- real high performance exhausts won't clear the filter. If you can find a short enough filter to work, Carlos, I don't think changing it every oil change should present any problems. I say this because in most automotive applications the filter only needs to be changed every 2nd oil change, along with the fact that so little mileage accumulates between changes. Sorry these are tardy. I've also used a Mann W917 which is shorter but fatter on my old setup (like yours) and it worked fine, it won't work on my current setup with building stand offs for the filter mount. I'll take some pics of both filters on the bench for comparison. Thanks Mike. Good idea on tke filter cover. Why is a filter cover a good idea ? Never heard of one before. He's using it to help insulate the filter/oil from the heat of his exhaust. Is that a piece of black drain pipe covering the filter? They make really nice billet aluminum covers that supposedly also act as a heat sink to cool the oil. $20 at Speedway Motors. That speedway filter looks cool. Its a piece of heater box to heater channel tube. It slips right over the filter nice and snug. I figured it would help with road debris as its behind the rear wheel. 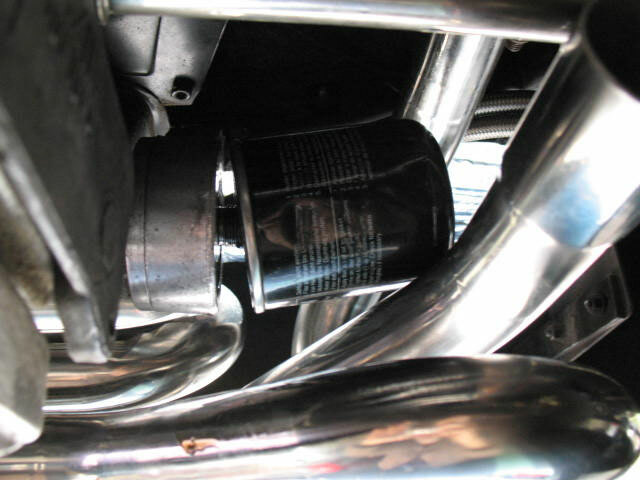 While using some sort of shield for an oil filter mounted in the wheel well is probably a good idea, to be honest , I've never heard of any one with this set up damaging a filter on the street, which leads me to ask- are we creating a solution for a problem that doesn't really exist? Don't take this wrong- I'm not trying to be difficult or rude here. Has any one had this happen to them or have first hand knowledge of it happening to someone else? Again, I'm asking because in all the years I've been playing with Volkswagens I don't think I've ever heard of this being an issue on the street. Not trying to be difficult here but I'd like to understand more. 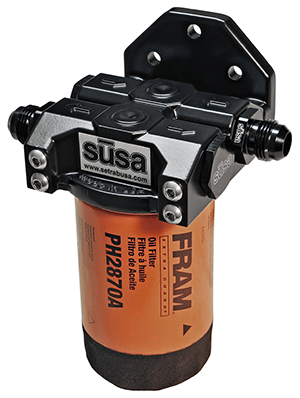 If a filter has a cover, would it not be more likely to keep in heat ? Secondly, if the cover is used to repel heat from the exhaust, I think it might attract it and thus increase heat to the filter. In aircraft for instance, sometimes there is a "stand alone" heat shield installed between the exhaust and the item needing heat protection. In that case the heat would go from the exhaust to the heat shield and get dissipated by air flow over it before getting to the item needing less heat ( oil filter in this case ). Your reasoning is sound to me, David. I wouldn't want to enclose the filter, but (as you say) a heat shield would be beneficial. If worried about the filter in the fenderwell taking a hit, a shield part way around it that didn't impede airflow would give peace of mind. Hello Al, I have a long crushed stone driveway and once I exit onto pavement whats ever caught in the tires lets loose flinging it off into the the wheel well. I figured an once of prevention. Fair enough, Mike; I don't think anything that's small enough to get caught in the tire tread could develop enough force to pierce a filter canister, but I get your concern. 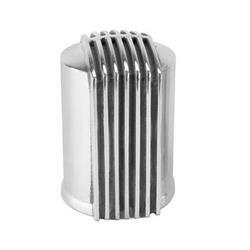 How about building a semi circular shield that protects the front and bottom and bolts to the inner fenderwell an inch in front of the filter? You could even put some really small holes in it so there's airflow (and, of course, with lots of holes it won't weigh so much- and if you make it out of aluminum even better! Hah! ).